At Rutgers, students work with respected engineers and researchers to serve New Jersey and the nation by contributing to the development of a more sustainable economy and environment. Our full-time faculty members, many of whom serve on advisory councils and local, state, and federal commissions, are leaders in their fields. Their research has been recognized in the areas of infrastructure evaluation and monitoring, intelligent transportation systems, transportation design and planning, geotechnical and geoenvironmental engineering, pavement engineering, construction management, water resources management, and air pollution monitoring and control. 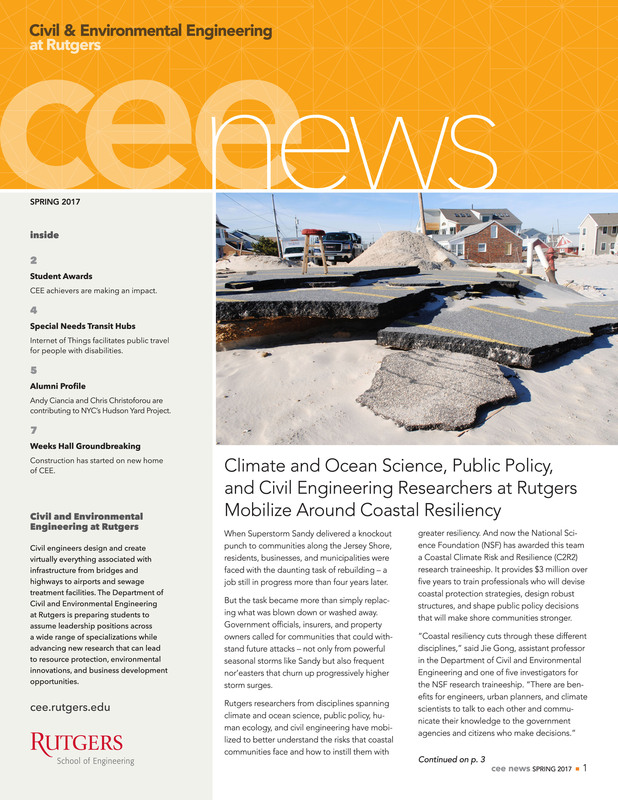 Technological advances, including a robot that examines bridge surfaces using sophisticated tools and a 3-D geospatial mapping instrument used most recently to assess the damage from Superstorm Sandy, are among the innovations that make Rutgers an exciting place to learn. The Department works closely with the Rutgers Center for Advanced Infrastructure and Transportation (CAIT) to develop sounder infrastructure in terms of safety, security, environmental impact, sustainability, mobility, and efficiency. During their last two years of undergraduate study, students may select from fives areas of concentration, including structural, geotechnical and transportation engineering, water resources and environmental engineering and construction management. Students may also opt to pursue one of our five-year programs to earn a BA/MBA degree or BA/BS degree in civil engineering and a liberal arts and science major. Graduate programs, leading to MS and PhD degrees, are offered in areas that include transportation engineering, structural engineering, water resources and environmental engineering, construction engineering, engineering geophysics, and geotechnical engineering and management. Our students benefit from local and international field visits, which enable them to apply theoretical principles learned in the classroom to the real world. Members of the Rutgers Engineers Without Borders program have travelled abroad to countries including Kenya, Thailand, and El Salvador. In addition to the extensive research opportunities available, students have many opportunities to gain hands-on engineering experience through summer internships in industry and government.